Tomatoes are one of my favorite foods. I love picking them up at my favorite farmers market and eating them in salads, burgers, and fresh pasta and anything else my heart desires. Lucky for me one of my neighbors has a beautiful cherry tomato plant that has more than enough tomatoes for him and I often come home to a bag of freshly picked cherry tomatoes hanging on my door. How pretty are these? When I pop one of these mini rubies in my mouth they taste fresh with a bright burst of a sweetness. Yum! 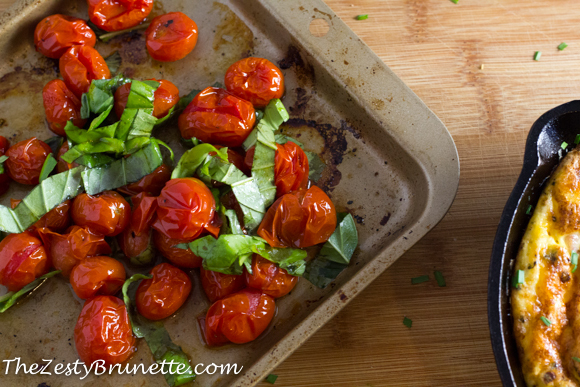 One of my favorite and simplest way I like to eat cherry tomatoes are roasted. It takes less than 15 minutes and couldn’t be a faster, fresh, or more attractive looking side dish. Here’s what I do. 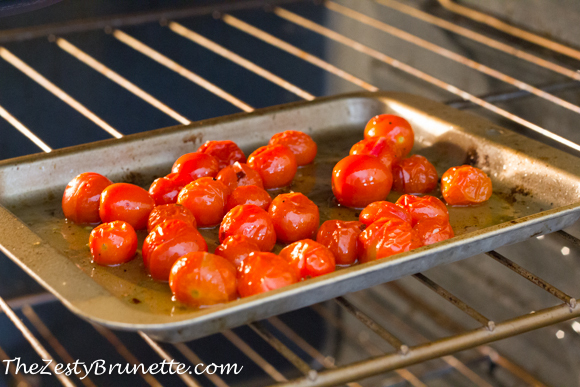 Preheat my oven to 425 degrees and rinse my cherry tomatoes and pat them dry. Spread them out in an even layer on a baking sheet and toss them with olive oil, salt and pepper, and a dash of red pepper flakes for a little heat. I then tuck them away in my hot oven for approximately 12-15 minutes until the tomatoes have burst a little. While their in the oven I stir them once or twice to avoid any burning. When they’re done, I pull them out and toss them with fresh basil! I love paring these roasted tomatoes with fresh fish, pasta, and even eggs – like my roasted broccoli and ham fritatta. How do you like your tomatoes prepared? Rinse tomatoes throughly and pat dry. 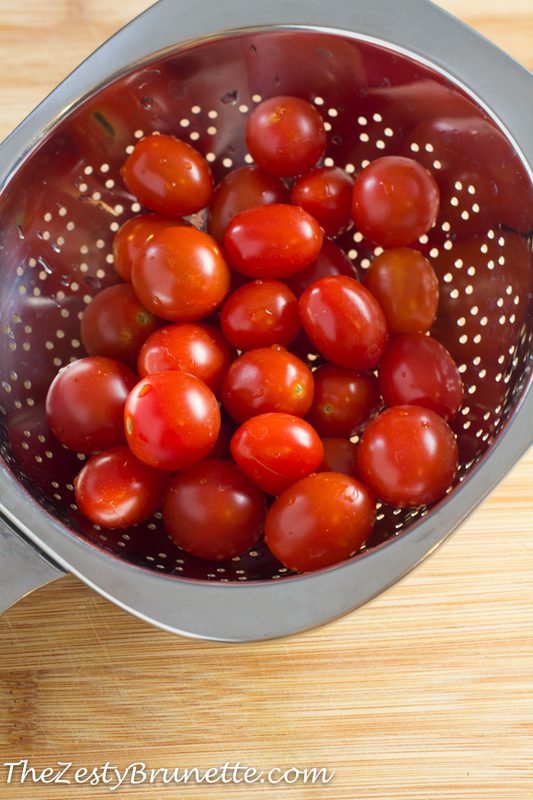 Toss tomatoes in olive oil, salt, peper, and red pepper flakes. Roast tomatoes for 12-15 minutes until tomatoes start to pop. Remove from over and toss with fresh basil.